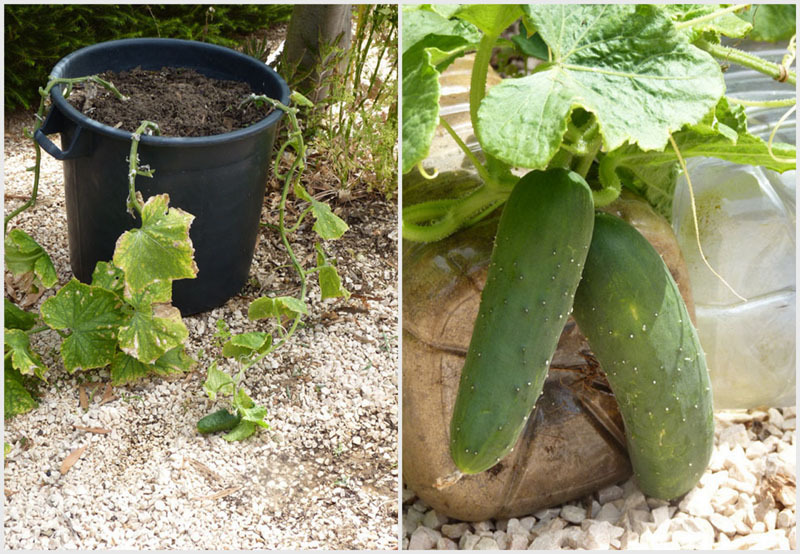 My monthly garden diary continues with my ongoing attempts to grow fruit and vegetables in pots and various containers. After various gardening disasters in May I learned some valuable lessons such as a basic understanding of soil nutrients, watering (under and over) and the size of the pots I should be using to name a few! 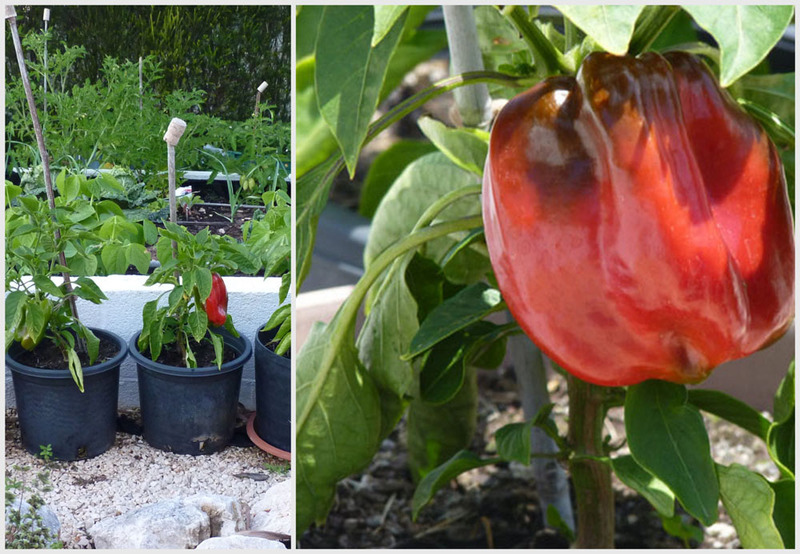 The red bell pepper plug plants planted in March are just beginning to ripen but, the orange peppers are still green. It’s a shame the pots I used are too small (8inch) as further research revealed containers should be at least 12” wide and deep for dwarf varieties and 16” diameter or larger for regular to large. Not speaking Portuguese I’m not sure which variety I bought – I’m just relieved they turned out to be be bell peppers not chilli peppers! So another lesson learned for my next crop. “Forewarned is forearmed” as they say, so I’m prepared for the worse should I not reap a good crop from each plant. I expect the leaves will probably start to yellow and…no doubt, I will have other problems as well. But at least I’ll know why! I feed the plants weekly with miracle grow at the moment and since doing so the leaves have turned from yellow back to green. Tip also worth noting: Do NOT let the plants dry out or allow to stand in water. I happened to mention to a friend (as you do) that I fancied growing potatoes in pots. Her hubby’s attempt had proved successful and they’d generously given me some of their surplus potatoes, which were delicious! Next thing I knew she was on the phone not only offering me 4 seed potoatoes, but also the loan of 4 pots to go with them. Before I could procrastinate further they were delivered to my door. I planted them immediately. I put a layer of gravel in the bottom of each pot followed by a few inches of soil, then the chitted potoato, which I covered with about 6 inches of compost. Apparently, potatoes grow from the fresh stems so you must keep the soil topped up as the foliage grows. I’m told they take about 12 weeks to grow? After my previous tomato disasters in May see How did I kill my tomato plants? I bought and was also given a selection of tomato plants to start again. 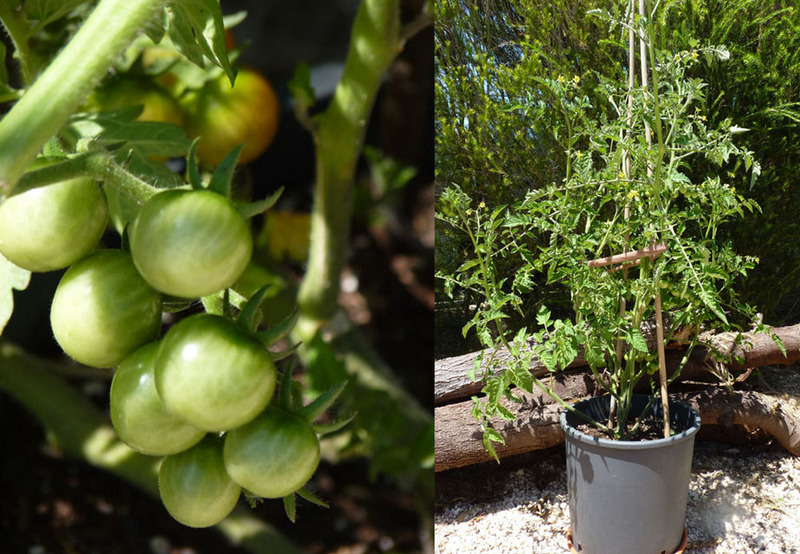 This time I planted the tomatoes in larger pots, and changed the compost and fertilizer. The turning point came when a friend kindly gave me some MiracleGro plant food to try, and my vegetables are now doing well. There is a downside, however – I can’t buy this product in Portugal and as far as I know, I can’t order online! My three cucumber plants continue to grow well and yield about two cucumbers a week. Next year I may attempt to make a frame so they can grow upwards rather than trail along the ground. My strawberry plants continue to give me a daily dish of mouth-watering strawberries. Forget the “forced” tasteless strawberries grown in Spain that seem to grace the supermarket shelves here in Portugal, everyone should try and grow their own! 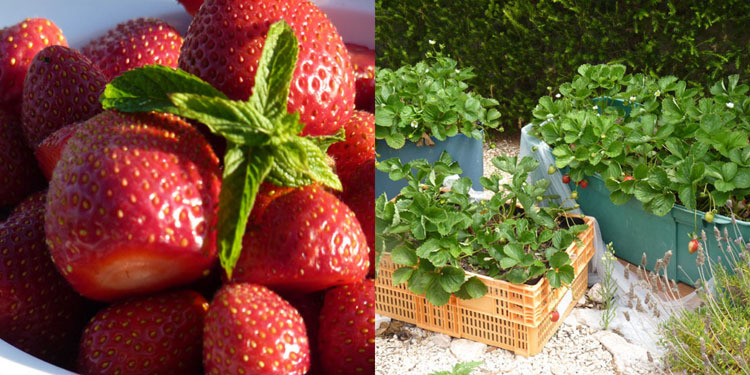 You can grow strawberries in a variety of containers from crates to plastic boxes in fact any containers you can lay your hands on. Just make sure you give them adequate drainage and good soil! 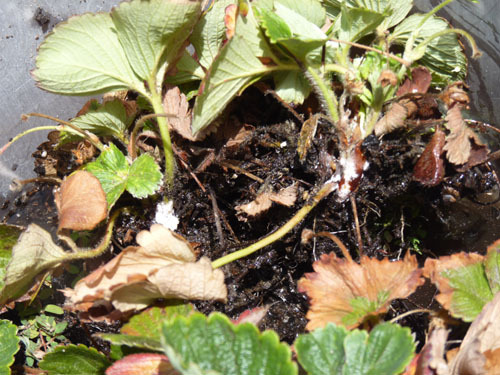 I inspect my strawberry plants regularly for any signs of pests and diseases. This week I noticed some of the leaves were going brown and closer inspection revealed the dreaded white mold on the base of some of the plants. I removed all the plants and disposed of those with white mold. The remaining plants I repotted in new soil and individual pots, away from the main crop. The container sterilised and recycled is now used for a baby leaf crop (lettuce). This year, dare I say, the rhubarb growing in a large container is doing well. However, I’ve started to feed with MiracleGro on a weekly basis and it has responded well. Fingers crossed! 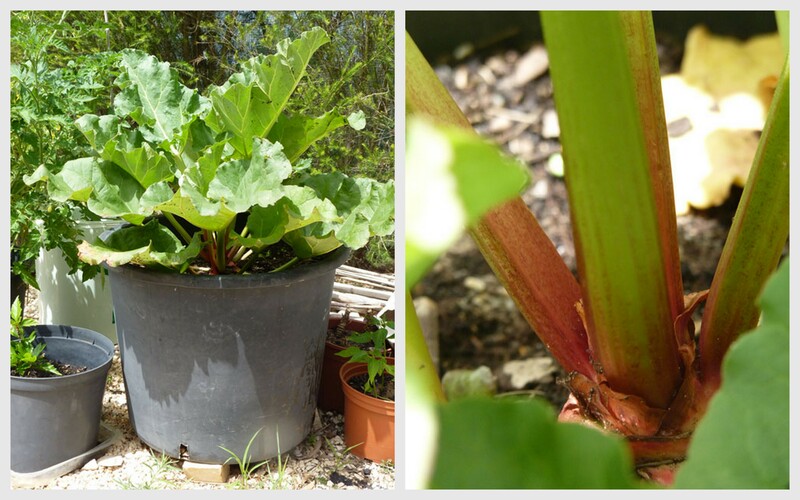 Looking at the picture above (April 2012), it’s amazing how much the rhubarb has grown.I’d only left it in the pot to overwinter as I was unable to find a suitable place in my garden to plant it. I’ve made many attempt to grow fig trees directly in the ground without success. What makes my failure so frustrating is that the pigging things grow wild along the road side and in the middle of nowhere. I read or was it someone told me I should try one in a pot – so here goes. This is a black fig and planted in worm pooh earth. It came with six figs, lost two and is now growing another. 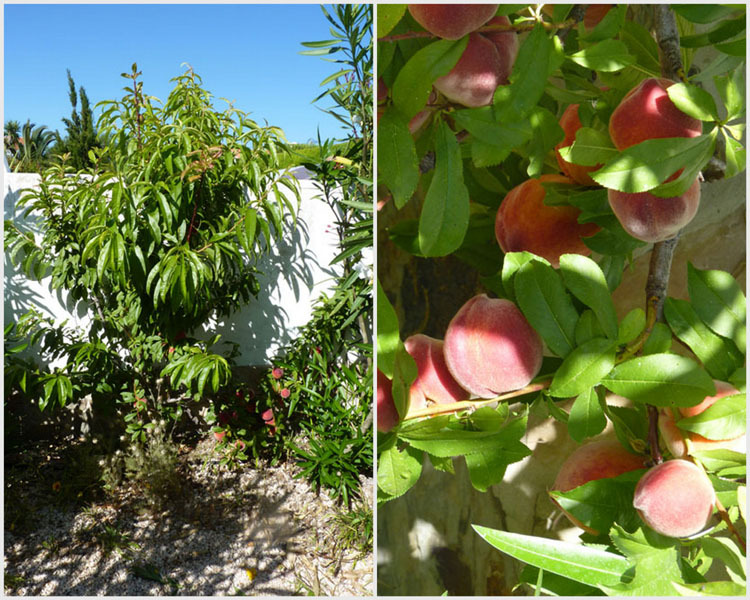 Peach tree grown from a stone! 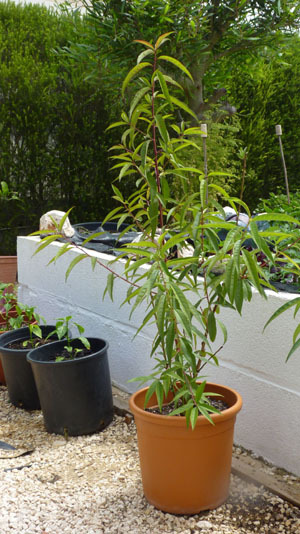 I was given a little peach tree (sapling) last year which had seeded from a stone thrown onto a friend’s compost heap. I repotted the little fellow in the spring into a larger pot and it’s now growing like a weed. Apparently it is an American variety of peach tree which is disease resistant. Good, poor little thing it needs some luck on its side living on Piglet’s plot! One day it should look like this! Once I’ve repotted in a far larger pot a friend is going to show me how to graft a cutting from the original tree (see above). Watch this space! Gasping for life and especially winter sunshine I made the executive decision to dig up this baby lime tree and rehome in a pot. It will now enjoy all year sunshine in a sheltered location. And, it will not have to compete with the invasive hedge roots! My lemon tree is doing well and this year has produced an abundance of lemons. The only problem being half the tree has died off and it is now rather uneven. Please don’t forget if you have any suggestions on growing fruit and veg in pots or would like to share your experience, please share in comments below! Looking good Pip! Now I know that if ever I visit you I should bring some Miracle Grow fertilizer! Thanks, fingers crossed they survive! Your potted garden looks great! What a wonderful variety you have…hope it all bears wonderful fruit! PiP, your green thumb always amazes me. Congratulations! Thanks Sally and happy belated Birthday! Brilliant. You’re growing such a wide variety of things in containers. I might follow your lead and try a few more things this way. Might be a great way to hopefully not kill a lemon tree (which I have done before in the ground 😦 ) and maybe I could even get another crop of potatoes. Even a small planting is worthwhile – it’s like you say about the strawberries, the taste is just something else! Can the lemon tree stay in the pot forever, and what size pot does it need? Do you need to water daily? 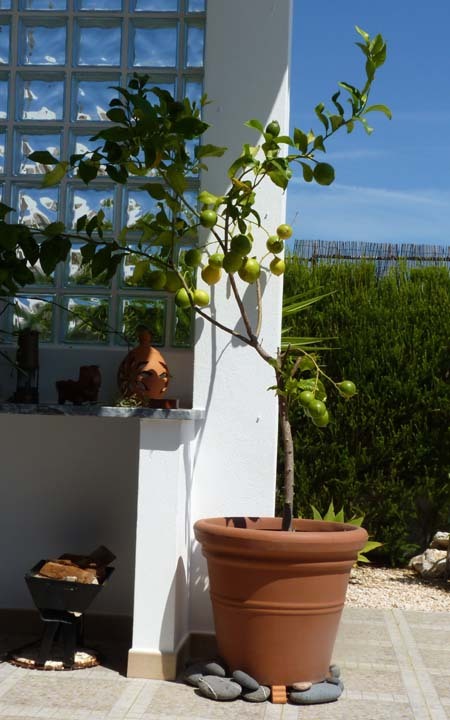 Glad you feel motivated to try growing a lemon tree in a pot! The pot needs to be as big as possible. 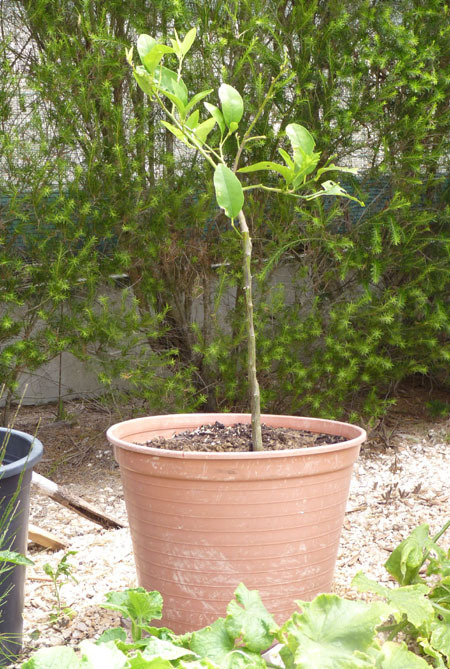 In fact, if my lemon tree was not growing rather lopsided due to half dying off down to a scale infestation, which I did not act on in time, I would repot into a dustbin size pot. In the summer I water my lemon tree every other day, but I soak it. 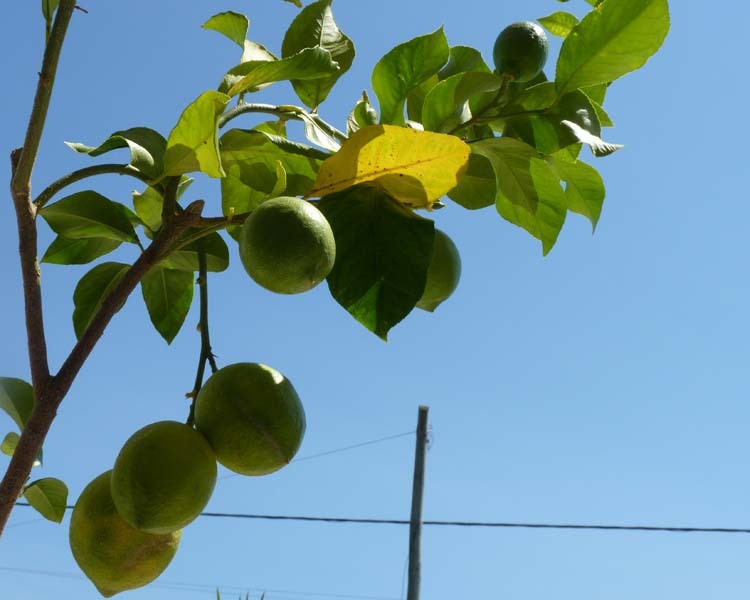 Not sure how long the lemon tree can stay in the pot, but there are varieties you can buy which are specifically for pots. Growing potatoes in pots is apparently a great way to save space. We will see, as this is the first time I’ve attempted. I’m also trying to grow produce that is expensive in the shops! Oh thanks so much PiP – this is all really helpful. Hi Piglet thanks for a very interesting post, you have certainly inspired me to try a few things I had not considered before. Pleased you feel inspired. I look forward to reading about your projects! Wow Pip, considering the problems you have encountered your potted garden is looking great. Your tenacity is well rewarded and an inspiration. So glad to see the rhubarb doing well, definately one for the record books. I am guessing that figs do not like TLC which is why they do so well on the road side. I am a capricorn so am renowned for my stubbornness. I’m really pleased with my rhubarb, can’t believe it is now doing so well. Still, the miracle grow feed may have something to do with it! 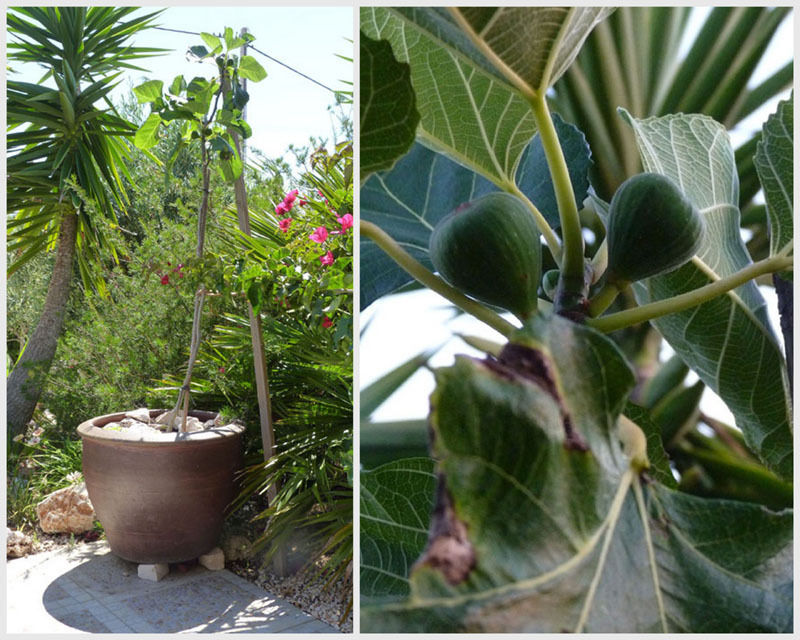 As for fig tree…we will see. I’m really impressed! It looks like you’ll be eating your own fruit and veg for quite a while. How are your courgettes doing? Hi, I’ve given up on courgettes. However, I’ts nice to know it’s not just me and others in my area are also experiencing diffiuclties. You have done so well! 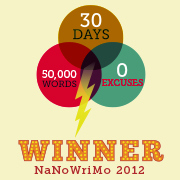 I have a surprise for you at my blog (hint hint…it’s an award!). Please visit and pick up your prize! Hi Mara, thank you for the award. It’s nice you thought of me – thank you! You’re a wonderful gardener. Your plants look healthy and happy. I can tell you put alot of heart and love into growing them. I bet your home is looking like a miniature Eden with so many nutritious and tasty fruits and vegetables growing everywhere. I really like the ‘growing potatoes in a container ‘idea, I’ll be looking forward to your updates about it. I may try to grow a few like that next year. Container gardening is so much fun. I love having fresh cherry tomatoes & herbs growing on my porch and I can hardly wait for the orange peppers to mature. Hi EC, Growing Peppers in a pot has certainly been a challenge. My own fauglt the pots were too small. Hope you have lots of success with yours. Good luck with the potatoes. I can’t wait to se the results of mine! Hey – our new house has a vegetable plot!!!! We are going to try to grow peppers, but I’m not sure if they grow in Victoria, it might be too cold! I might be hitting you up for growing tips!!! Hey TO, that’s great news! I must have missed your post about your new house 😦 Mr O will be in his element! It is only a couple of articles ago, so should be easy to find! Mr O will be in his element – nice lawns and even hedges to practice his pruning on! My peppers did well in Cape Town. I planted them in a large pot that happened to be there. I did well from pure luck….I did nothing to them. Hi Granny, sometimes I think I kill my plants with love. Looks as if your thumb is getting more and more green! Hi Piglet seems you are doing very well with your plants in Pots. Potatoes can also be grown in a deep container, like a 40 gallon drum. Plant in a foot of soil at the bottom, then fill the container with soil as the plant grows. When the plants start to die off, tip out the soil to have a massive crop of potatoes. Hi STeve, the 40 gal container sounds a great idea! I’m a virgin re. 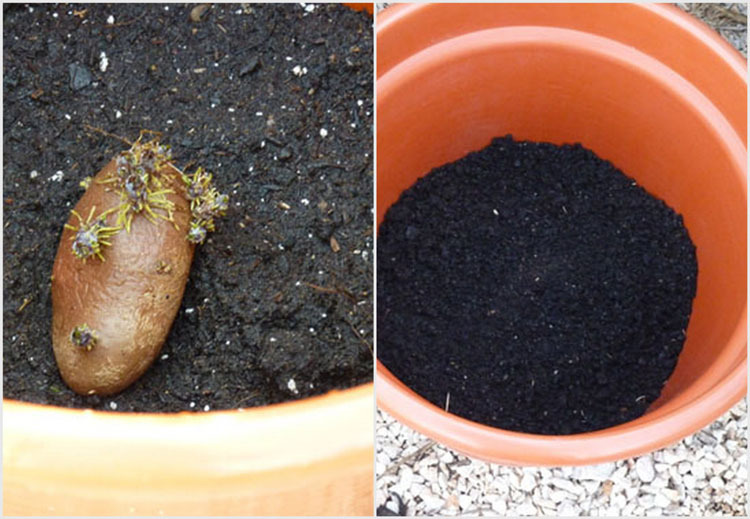 potato growing in pots, so will be intersting to see the results! Your plants are looking super! Bit of patience and look at them. We grow some of stuff but directly in the soil. And some of it flowers from the leftovers we bury as compost. Potatoes are a good example. We’ve got four lemon tress (all producing at last!) Avo (one fruit this year) walnut -nothing yet-Plum and Peach(abundance, but the birds get most) and an olive tree.Nothing yet. We have green peppers, cabbage, Portuguese (for bacalhau) and ordinary lettuce . As my wife and children run their own baking business they use a fair amount of granadila and now grow their own instead of buying the juice or fruit from the shops. Hi Ark, I so wish I could plant my veg directly in the ground, it would be so muc simpler! /not sure what granadila is? I have potatoes sporuitn everywhere in my compost heap, but never seemto produce any potoates! I used to order from Amazon but now they would charge £100.00 or more to send 3 Miracle grow pellet fertilizer in kilo jars +1 x bag of Miracle grow expanding soil to me here in Portugal. Shop around the garden centres and maybe it is possible to buy the equivalent. If anyone knows who sells Miracle grow please let us know. I so far only grow flowers in pots but would like to have a go at fruit & veg after seeing what piglet can grow. Well done you. The best way to order is to have it delivered to Direct Transport or ALgarve Removals in the uK. They then ship to Portugal for about £10-20. You can include other products as well. Don’t bother iwth Amazon order direct from other sources. Pingback: 6 Vegetables You Can Plant With Small Pots. Even If You Don’t Have A Garden, Really! Great interesting and informative blog. Ive just returned from Algarve (on holiday from UK for 1 week) Ive been a couple of times but noticed this week particularly how fresh, and uneven (such veg shaped but milder sold as wonky veg for example in Tesco for cheaper) got me thinking are most vegetables and fruit sold in Portugal organic or less pesticides etc used when growing?